1. The EU offers terms to Ukraine for an economic deal. 2. Russia offers better terms: Ukraine takes the Russian deal over the EU. 3. US-government-funded protesters destabilize Ukraine. 4. Russia sends troops to defend their strategic interests. If US power-players didn't see this coming, they should be fired for incompetence. If they did, they should be fired for recklessly risking the stability of the entire world. This is a weird reverse echo of the Cuban Missile Crisis, and no less dangerous. Ukraine acts as a buffer zone between Russia and the increasingly hostile forces of the West. By acting to remove this buffer, the Western axis may as well have declared war on Russia. 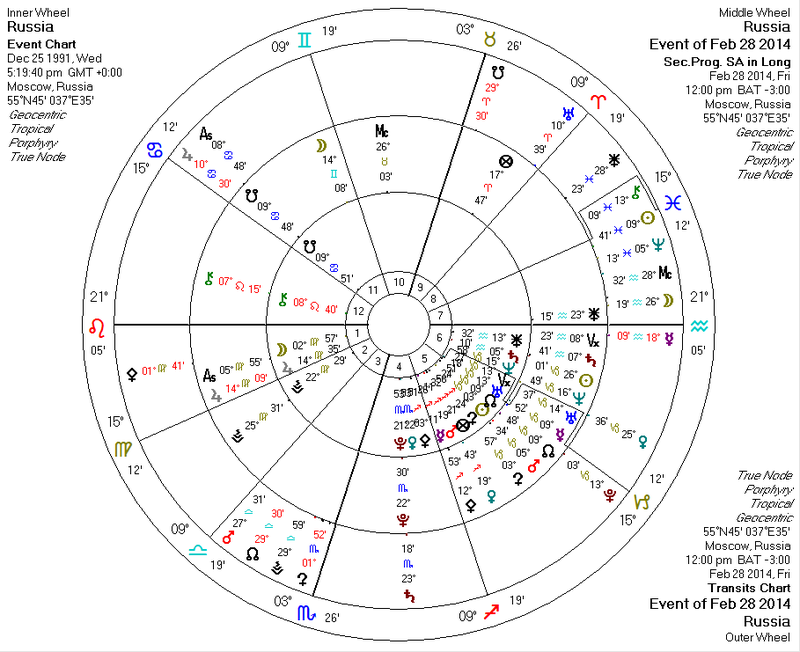 Transiting Pluto novile Russia Pallas and semisextile progressed Pallas: Ethical Crisis: a transit that forces us to make a decision with potentially very serious ramifications. Transiting Pluto conjunct Russia Uranus (ruling the Seventh House): This one is very literal, representing a powerful upheaval (Pluto) involving a rebellion (Uranus) supported by foreigners (Seventh House). Transiting Saturn conjunct Russia Pluto in the Fourth House: power struggles (Saturn/Pluto) over land (Fourth House). Transiting Pallas conjunct Russia Moon: a focus on the military and/or preparations for fighting. Well, at least Vladimir Putin seems like a somewhat rational fellow (i.e. not entirely a homicidal maniac). I can't say the same for the current trigger-happy arbiters of US foreign policy.